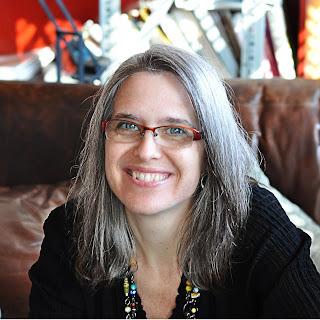 This is the second installment in my blog series "Getting to Know You." Meet some of my favorite artists/authors, and in the process we'll learn what makes them tick. It's all inspiration for the muse! 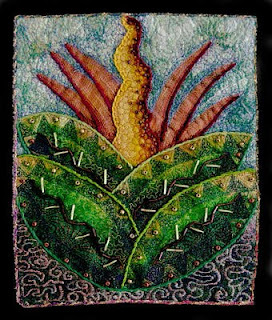 This month we're getting to know fiber artist, mixed media marvel and quilty quilter divine Judy Coates Perez. 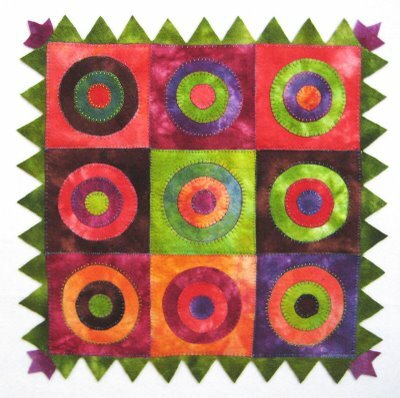 You've seen Judy on Quilting Arts TV and she is famous for her award-winning quilts designed with "Painted Threads." Judy, we've known each other for a few years and I have always admired your painting skill. How did you become such an awesome painter? Did you take a traditional route or teach yourself? I have a graphic design degree from Otis Art Institute of Parsons school of Design. As part of my curriculum I took drawing classes as well as a couple illustration classes. In my typography classes we had to perfectly render enlarged letters from specific typefaces with ruling pens and paint brushes, that really works to develop hand skills. I learned a lot about painting from my ex when we were in school because his father was an amazing painter and had taught him. The one thing to keep in mind, is that painting is primarily a skill, once you learn some basic techniques, like anything else the more you do it the better you will get. you know- practice, practice practice. I still feel like a painting novice in many ways and would love to learn more since I mainly focused on design while I was in school and now regret not taking more classes on painting. How do you describe yourself as an artist and what path brought you to your current incarnation? Was it fate, serendipity or design? I consider myself a mixed media textile artist. It was not a planned thing it just sort of developed over time. 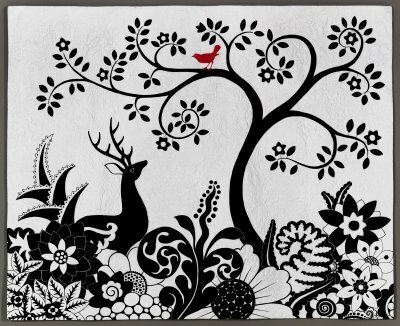 In high school I spent all my time in the home-ec room and art room, so working with fabric, paint, paper and sewing is like a perfect fusion of the things I love most. You teach a variety of classes. How do you approach teaching someone how to make art? I try to teach skills, techniques and how to use various media so that people have more options for making their art. I think the more tools you have under your belt the better equipped you will be to communicate your idea or vision. I love your fiesta ornaments. How's your sewing machine holding up with all that metal stitching? Sewing aluminum won’t hurt your machine at all, have you ever tried sewing a pair of jeans? that is way harder on your machine. All sewing machines will sew aluminum with no problem, the copper is different since it is harder. Machines with metal gears will sew through it fine, the ones with plastic gears may not. My old Bernina and Pfaff go right through copper like butter, but my Janome does not want to sew it, but it doesn’t want to sew two layers of canvas either. I remember reading once that you could sharpen scissors by cutting through aluminum foil, so technically sewing through aluminum might be sharpening your needle. Copper is thicker and harder and will most likely dull your needle, I use a designated top stitch needle for that. You're going to be part of the first ever Cloth Paper Scissors CREATE! retreat. What do you think this experience offers that's new (besides whatever Pokey has up her sleeve--I mean, I'm a little scared, how about you)? Oh my gosh, I am so excited, anything Pokey’s involved with is bound to be a blast. 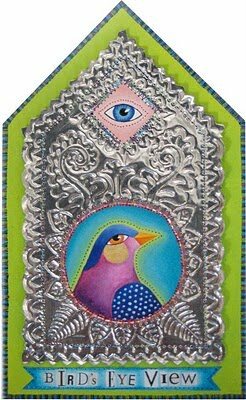 I have never taught at a purely mixed media venue before so I am really excited about it and seeing all the new things people are teaching there, I already have my eye on a class or two I want to take. I see some Mexican influences in your art. What cultures and images inspire you? I derive a lot of inspiration from my life experiences and fascination with global cultural traditions and mythology. When I was 12, my family moved out of our house, put everything in storage and drove to Guatemala, traveling through the US, Mexico and Canada, 18,000 miles in all. We spent a year on the road and rented a house in Antigua Guatemala, studying the arts, culture and archeology of these countries. My mom and I also spent time learning back strap weaving from Indian women in Guatemala. In college I went to Japan to study graphic design and now I have just returned from teaching in New Zealand, I find that it all influences me in some way. Some of the nature inspired imagery has come from things my kids were studying. For example, when we lived in Texas my son was obsessed with fossils and lichen, I have made work based on both of those subjects. You're skilled at quiltmaking, painting, vessel forms and a variety of fiber arts. Is there anything left on your artistic "to do" list? I don’t think I have a list per-say, but I am interested in trying new techniques and mediums, I am always looking at everything with the perspective of “will it work with fabric?” I have a lot of ideas that I would love to spend time exploring, but it seems like there just aren’t enough hours in a day. What's the big news at Painted Threads? Create Retreat in Chicago, Aug 28 & 29 and IQF Houston Nov 2 & 3. That sounds like an excellent idea! Thanks Judy! Judy is so gosh darn talented! I have one of her original bird images (yea!) 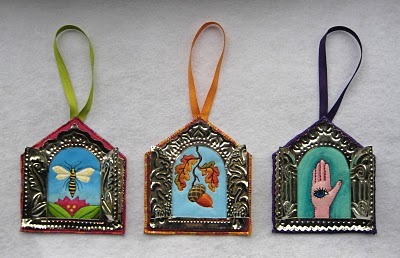 and I just love her fiesta ornaments. Fascinating to hear about her living in Guatemala..no wonder the Mexican influence is sooo true in her work. And, because of her, I've felted soaps and dyed batting. Judy rocks! Thanks so much for the interview with Judy. 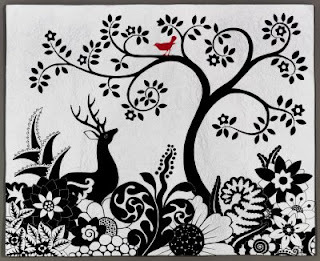 I have been a big fan of her work for years and love what she does with paint on fabric. I was gifted her DVD's for Christmas and they were life changing! I actually put paint to fabric and had fun doing it! Thanks again! Thanks for giving us the opportunity to learn something about Judy!! I have always loved her work! How exciting that must have been, her year in Guatemala! Just to pick up an travel 18,000 miles to learn about other cultures. Awesome!! She sure has been blessed and I can see it in her work! Thanks for the inspiration! 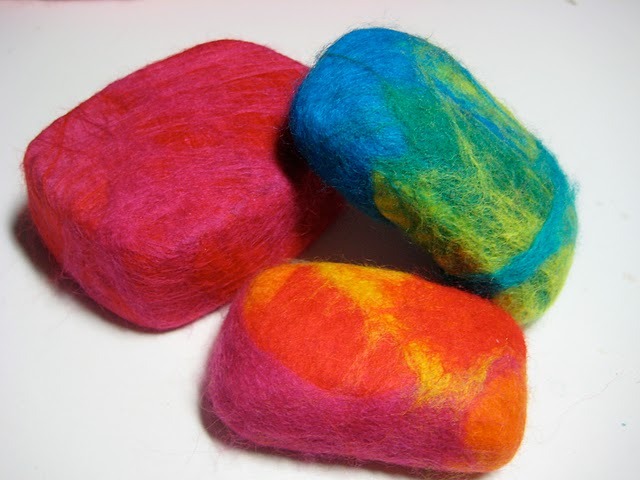 Now, am going to go check out the felted soaps! Thanks for posting this interview Kelli! I love getting to know Judy and where she is coming from. She is an artist I admire. V. nice work! She has good style and I love the punched tin and those charms!! Thanks for this. Great interview, Kelli & Judy! I love Judy so much and it is always nice to read a bit more about how she approaches her art. Thanks! Judy is an amazing artist and a very special person, thanks for putting up such a great interview!